We’re huge proponents of protecting your skin from the sun’s harmful rays and although we tend to talk about it quite a bit, we really do believe it’s critical not only to keep us looking young and fresh but also to protect our health. So, when we read the results of a case study published in the prestigious New England Journal of Medicine that makes a definite link between exposure to sunlight through glass and sun damage to the skin, we knew we had to share it immediately. The study focused specifically on one 69-year-old male patient who presented with significant skin damage to one side of his face. 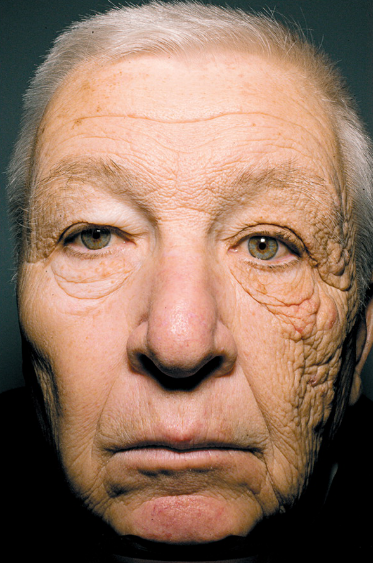 He reported that he had driven a delivery truck for 28 years, thus being exposed to sunlight through glass predominantly on the left side of his face. It was ultimately determined that the thickening and wrinkling of his skin was consistent with what is called the Favre-Racouchot syndrome of photodamaged skin, but in this case the dermatoheliosis was unilateral (in other words, the sun damage was only on one side of his face)! As a result, scientists are now claiming confidently that while glass can block UVB rays, UVA rays can indeed transmit through glass windows and cause damage to the skin’s layers. Chronic exposure can lead to destruction of the skin’s elastic fibers permanently as well as DNA mutations and toxicity that can lead to skin cancer. Furthermore, while cars’ windscreens tend to be chemically treated to block UVA rays, other windows and the glass in many office and residential buildings is not. While there has long been confusion as to whether you can indeed suffer skin damage through glass, we think this particular study (and the growing body of evidence that supports it) is pretty convincing. Given the potential gravity of the results, we definitely believe even more strongly in the importance of using SPF on our face and body every single day, even if we are only going to be exposed to sunlight through windows. As such, expect even more sun protection related posts from us in the future!